Alumnus Nima Ghalichechian (EE Ph.D. 2007) has received an National Science Foundation CAREER Award for “Understanding and Exploiting Non-Linear Behavior of Phase-Change Materials for Millimeter-Wave Applications.” The five-year, $500K award will foster fundamental studies vital to future radio-frequency reconfigurable communication systems. Research will focus on phase-change materials and their applications in the millimeter-wave domain—specifically in passive imaging sensors. This research promises to open doors in the millimeter-wave band and beyond. 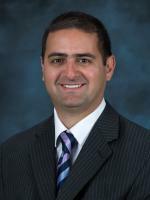 Ghalichechian is an assistant professor in the Department of Electrical and Computer Engineering and a member of the ElectroScience Laboratory at the Ohio State University. He is the principal investigator for the RF Microsystems Laboratory. At Maryland, Ghalichechian was advised by Professor Reza Ghodssi (ECE/ISR) and was a member of the MEMS Sensors and Actuators Laboratory. NSF’s Faculty Early Career Development (CAREER) program offers the foundation’s most prestigious awards in support of early-career faculty who have the potential to serve as academic role models in research and education and to lead advances in the mission of their department or organization. Future wireless communication systems are expected to support significantly higher data rates. These higher data rates are generally achieved by using higher frequencies. One area of the electromagnetic spectrum that uniquely fits this purpose is called the millimeter-wave band, composed of wavelengths in the order of a few millimeters, at frequencies between 30–300 GHz. Reconfigurability and adaptability will be vital features of future agile sensing, imaging, and wireless communications millimeter-wave systems. However, when radio-frequency systems are made reconfigurable, they become lossy, neutralizing any gain achieved by reconfiguration. These losses (low efficiencies) are the Achilles heel of any radio-frequency reconfigurable system. The project will address this fundamental limitation. It will foster fundamental studies on phase-change materials and their applications in the millimeter-wave domain, specifically, passive imaging sensors. Applications for these sensors include medical imaging, navigation, remote sensing, and robotics. Phase-change materials are attractive choices for millimeter-wave reconfiguration as they provide a path to achieve low-loss microsystems. One unique feature of phase-change material is non-linear or abrupt change in physical (i.e. electrical or optical) properties such as permittivity or refractive index with temperature, strain and current. Metal oxides such as vanadium dioxide belong to a sub-group of phase-change materials that exhibit reversible metal-insulator transition. These materials provide a path for realization of low-loss radio-frequency microsystems. 3) explore novel device architecture, especially, using selected phase-change materials such as vanadium dioxide or other candidates, to reduce or eliminate losses while achieving unique functionalities. A new class of passive imaging arrays (millimeter-wave camera) is expected to exhibit significantly higher responsivity in this band than current state-of-the-art sensors. In addition to the fundamental studies, the proposed work is ambitious but potentially transformative as it challenges the conventional wisdom in designing sensors and dominance of semiconductor-based millimeter-wave detectors. Currently, no acceptable solution is available for millimeter-wave imaging systems operating at room temperature.